Did you know that there is a tweak that you can do to your Business Objects server’s Query Builder main page “query.jsp” so that it can handle “Path Queries”? Do you know what a “Path Query” is? Do you know why you should care about “Path Queries”? 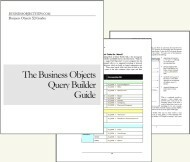 I was originally introduced to Path Queries by a posting at an SAP Business Objects Blog on the topic by Ted Ueda. The article got me really excited to try out this new syntax and seemingly simpler method of querying my CMS metadata. Path Queries are very different from SQL queries and they are basically written like this path://InfoObjects/Root Folder/My Folder/*. This simple example would return all of the objects in the “My Folder” folder. Cool, huh? Path Query syntax actually gets a lot deeper. It allows you to specify relationships between objects (the above example defaults to a parent-child relationship), specify filters, sort order, and they can even function as a kind of sub-select. For example, returning all groups for which the user Administrator is a member. If you would like to learn more, keep an eye out for future articles on Path Queries or better yet, get your hands on our popular “Query Builder Guide” which completely explains Path Queries and the exciting SQL “Relationship Queries”.